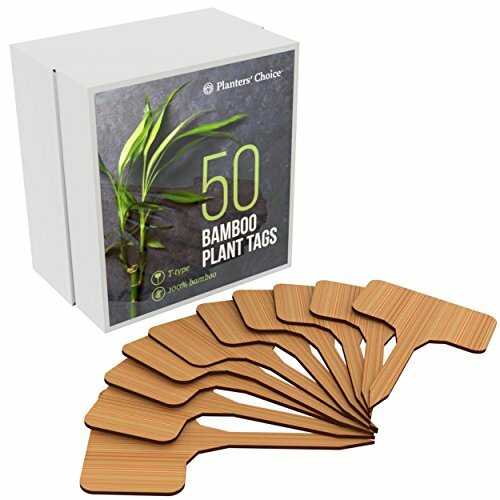 Planters' Choice 50 Bamboo Plant Markers packaged in a sleek box.  PLANT IN STYLE: Plant markers shouldn't be an eyesore. Keep track of your plant with these stylish T-type bamboo plant markers. Unlike plastic markers, these are made from 100% bamboo and blend in with your plants.  ECO-FRIENDLY: Plastic and nature don't go together, so don't use plastic markers for your precious plants! Made from 100% natural bamboo, a renewable resource, these markers are eco-friendly and help the planet.  PERFECT SHAPE & SIZE: Measuring in at 4" tall x 2.15" wide on top (1.35" tall on the top part) these T-type markers provide ample space to write the name of the plant and its date without having to cram any letters. Each marker is 1/16" thick rendering them very durable and standing the test of time.  SUPER VALUE PACK: You'll find 50 bamboo plant markers packaged neatly in a beautiful box, giving you enough markers for all your needs and more. Use as much as you need, and store easily the rest in its neat compact box until your next planting opportunity.  GREAT GIFT FOR GREEN THUMB: This is the perfect gift for that someone in your life with a green thumb. They are packaged in a sleek, presentable box - all you need is a ribbon! If you have any questions about this product by Planters' Choice, contact us by completing and submitting the form below. If you are looking for a specif part number, please include it with your message.